God's Psychiatry teaches readers how to acquire confidence, courage, and a new look at life. Dr. Allen teaches how to banish fear and worry, how to root out hate and suspicion, how to show true gratitude and generate appreciation with your friends and loved ones plus how to face life with enthusiasm and peace through the teachings of the Holy Bible and discipleship with Jesus Christ. In this powerful book, Dr. Charles L. Allen explains the essence of God's Psychiatry through four of the best-known passages of the Bible: The Twenty-third Psalm, The Ten Commandments, The Lord's Prayer, and The Beatitudes. These prescriptions along with your ongoing relationship with our Lord and Savior, Jesus Christ will help cure discouragement, depression and doubt plus dramatically and positively change your life by aligning with the Word of God. A wonderfully written book helping anyone who has faced struggles in their lives. Well written and easily understood, this book gives helpful and practical suggestions to help one heal, bring happiness, and ultimately, lead a better, whole, & healthy life. 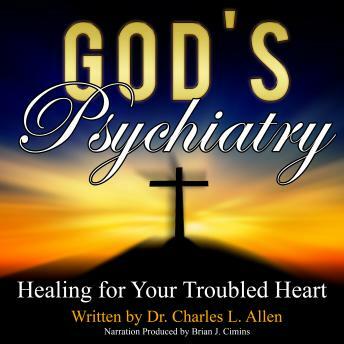 God's Psychiatry by Dr. Charles Allen moved me so much by helping me to easily understand the 23rd Psalm, The Lord's Prayer, The Beatitudes and the Ten Commandments and lifting me out of depression. The Author passed away in 2005 and missed the Audiobook revolution and this long lost gem version was originally published in 1953. It clearly explains in heart and soul filled detail with tons of early 19th century examples, parables and lessons in over nearly 200 pages for those suffering with depression, anxiety and the dis-ease of the soul.